Well, November 2012 has proved to be an eventful month. Firstly, as we are nearing the Praktika Concert audition, our teacher has slotted in an extra repertoire slot after point on a Saturday. In addition, we will all practice our solos on the academy stage (where the audition will be) at some point in the next week or so, one small group at a time, so we are all receiving a lot of individual focus on polishing up our pieces. This, of course, is great and I’m really enjoying working on my solo ( now changed to Fairy of the Woodland Glad from Sleeping Beauty) and being coached by our teacher. This, to me, is the most important part of the whole Praktika Concert experience as I’m not here to worry myself over whether or not I will be chosen for it- as a matter of fact, being only on the Traineeship course compared to those who have studied here for three or more years puts me in a very unlikely position, however, the chance to have so much personal feedback and corrections plus dealing with the actual audition itself is a massive opportunity to learn. 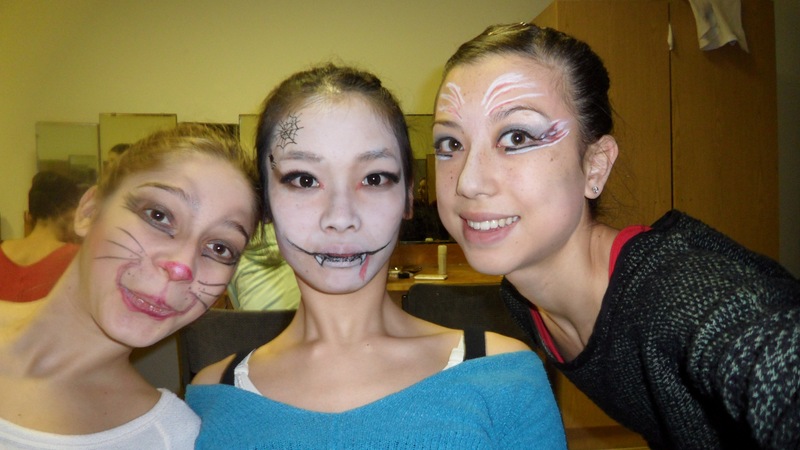 In other lessons, such as make up, we have learnt how to do the Giselle hairstyle, French rolls and, one lesson, were allowed to do whatever make up we liked! I took inspiration from a bird (as in, it started off as a bird and then became something of which I’m not really sure how to describe). Character has seen us begin to learn a new Don Quixote group piece and, in Russian language class, we are revising everything we have learnt so far in order to cement it in our heads before the holidays. Also, November has been the month of, not one, not two, but three theatre outings! My friends and I have discovered a much preferred method of acquiring theatre tickets- by asking our character teacher who works in the Bolshoi Theatre! So long as there are spare tickets available, he can sneak us a few. For that reason, once we had decided upon Giselle as our next performance, we didn’t ask for the Friday night showing, when Svetlana Zakharova would be dancing, as it would surely be fully booked and, of course, we had been lucky enough to watch her in Swan Lake last month. Our first visit of November, however, was on that very same Friday to see the Academy’s performance of La Fille Mal Gardee whereby we could watch from backstage. It was shown in the New Stage which I had never seen before and I enjoyed watching the older dancers of whom I aspire to dance as brilliantly as. We didn’t lose any time; at the interval of La Fille, we hurried over, through corridors and down stairs, to the other, most famous Bolshoi Stage. Unbelievably, we were backstage with the Bolshoi company, seeing the second act of Giselle from this incredible perspective! And, to top it all, there was Svetlana! We had perfect view of that develope a la second, definitive of Giselle in spirit form in the final act of the ballet, and, at one point, she ran right past us as she exited from the wing we were standing by! Finally, after the curtains had closed and Svetlana had taken her umpteenth bow to the crazy screaming people on the front rows, we actually managed to get the only photo she allowed be taken of her that night, with us standing right next to her! The experience was so surreal I still can’t believe it happened. So, in actual fact, I saw Giselle one and a half times, including the Saturday performance to which we had seats. Nina Kaptsova danced the lead and I loved how the first act contrasted so much to the grey shadowy tones of the second; full of dazzling, rich autumnal colours. 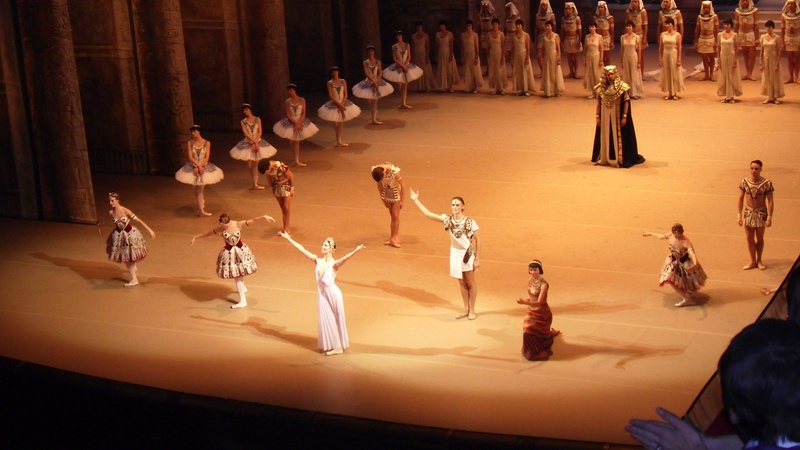 The third performance was La Fille de Pharon- a three act ballet only danced by the Bolshoi. I don’t think I’ve ever seen such a grand, extravagant ballet where there are countless costumes, elaborate sets, numerous solos and intricate patterns for the corps de ballet. It was a real explosion of dance and colour on the stage with choreography that must have killed the dancers- all jumps, fast footwork and turns. Lots of things have been happening at home too. The first ever Proud of Barnsley Awards in which I was nominated for the Young Superstar Award by my first dance teacher, Miss Hayley, the Barnsley Chronicle and my Grandma. Although, being in Moscow, I couldn’t attend the awards ceremony, my Mum, Grandma and Miss Hayley went in my place. To my surprise, I won! It was such an honour and I feel so happy to have my Barnsley roots, of which I am so proud, celebrated- I won’t forget it. The award is a fabulous Graham Ibbeson bronze sulpture – I’m so proud to now own such a wonderful award. Finally, as the title suggests and as I hinted at earlier, the closing of November sees the beginning of December, the last month, less than four weeks until I fly home, almost time for Christmas! It has snowed many more times here recently and the atmosphere just seems to become more and more Christmassy! I can’t believe how close it is to me returning home for the holidays; I’m really looking forwards to seeing all my friends and family and cooking lots of my favourite foods!